I am a slow starter. When I am beginning something new, I tend to hang back, observe, and try and make sense of things from afar. And then, one day (and no one can predict what day it will be), things come together and I experience a breakthrough. And suddenly the whole world looks different for me. My freshman year of college, I tread very carefully. I was too aware of the statistics that say that only about 65% of students who begin college actually graduate. As a first-generation college student, even though I excelled in high school, I worried that I would somehow become one of those statistics. I took only three classes that first fall, and I didn't even think about getting involved with extracurricular activities. Instead, I hung back and tried to figure out how being a college student worked. While my peers were running for student government, joining greek life, or trying to work in professors' labs, I just watched. And then, one day in spring quarter, everything sort of came together. I met with a co-chair of one of the large community service organizations on campus to learn a little more about what they did, he encouraged me to apply for its board, and the next thing I knew I was responsible for the weekly volunteer experiences of hundreds of students. My involvement snowballed from there, and by the time I graduated I was one of those crazy super-involved students, and was practically living at the student center. The idea that I'd started out worried about simply graduating seemed laughable. A lot of my experiences of learning and exploring have been like that, and as I find myself mid-way through the early stage of Luganda learning, I realize that my language learning is the same. I have made slow progress at the beginning. I've taken my time to understand what resources are out there, which ones suit what purposes, and some of the basics of how the language works. I worked to learn bits of disconnected information from multiple sources. And though I was definitely learning, I still felt abysmally far away from anything that could be described as even beginning-level proficiency. And then - Thursday happened! 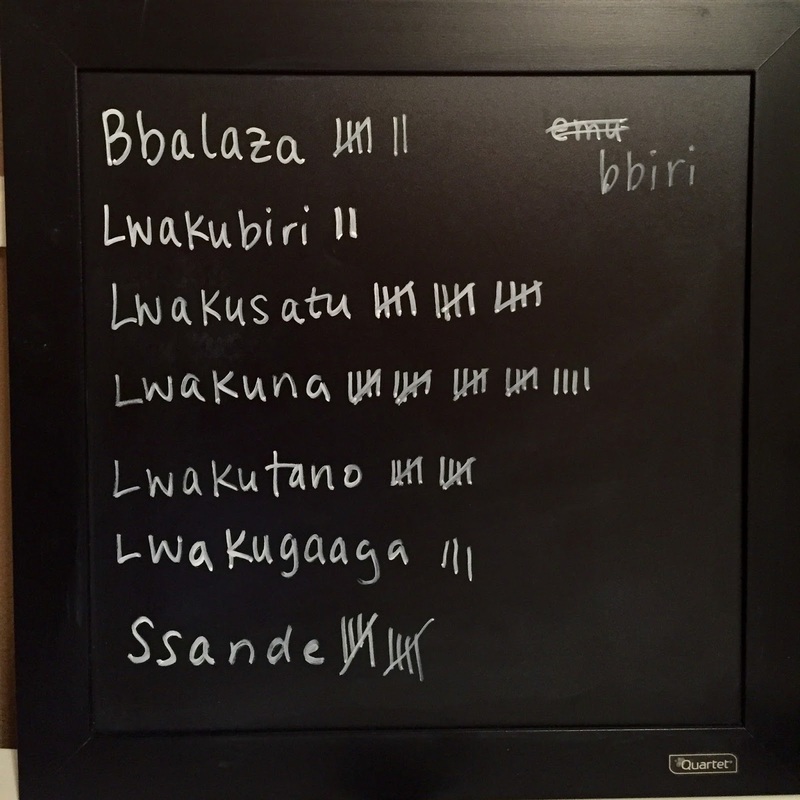 I had one long, free afternoon that I decided I would dedicate to Luganda practice. As I started to work, I could feel something changing. Things started to feel more familiar, words were coming to me more easily, and I was beginning to feel connections forming between the different things I'd learned. I can't exactly explain what was different, but it felt like a real breakthrough - the first I've had. On Friday, I had my regularly scheduled time with my language mentor. As we began, we started to exchange some of the questions/answers on topics we'd worked on previously. And then, I'm not sure how it happened, we strayed a bit. We began to discuss other things. I struggled through lots of vocabulary I didn't have, but with support, we ended up having what felt like a real discussion about my life in Madison. It lasted maybe five minutes, but again, it felt revelatory. I wish I could say that either of these experiences represent an actual breakthrough in terms of my language level, but I don't really think they do. 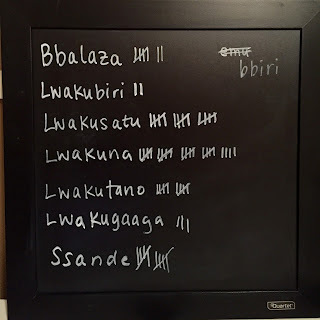 Instead, I believe that these experiences signify a change in my approach to the language, and the first time I've really felt like I can use Luganda in some sense. These little breakthroughs are kind of like my meeting with the co-chair that spring: after lots of observation, a first step towards activity, progress, and synthesis. More than anything, this breakthrough is an emotional one, and I have to say, it feels really good. All of the positive feelings are also a huge motivator for me to study daily. While I can't expect that this week will see the same kind of breakthrough, I'm looking forward to soldiering on, in anticipation of the next one.